It’s the million dollar question for Android users. No matter how many tutorials or guides you read, there will always be doubts: How can you free up space on your smartphone? Well, we’ve put together a useful guide that includes 10 tips to help you clear out local memory space, along with the best apps to help you get the job done automatically. The creation of temporary files in the innermost system folders means that a huge amount of wasted space can easily go unnoticed. DiskUsage is an incredibly useful app that’s really similar to WinDirStat for Windows. What it does is scan the system and then shows a mosaic with boxes that represent the size of each file on the system. This way, you can easily see if there are any monsters hiding anywhere on your smartphone. This one’s a classic problem that a lot of people aren’t even aware of. Each time you send a document via WhatsApp, the app saves a copy of it in your system. What’s more, if you send the same photo multiple times, it’ll be saved as many times as you send it. You can delete them manually by going to WhatsApp/Media/, but there are easier ways to do so with the help from specialized apps. 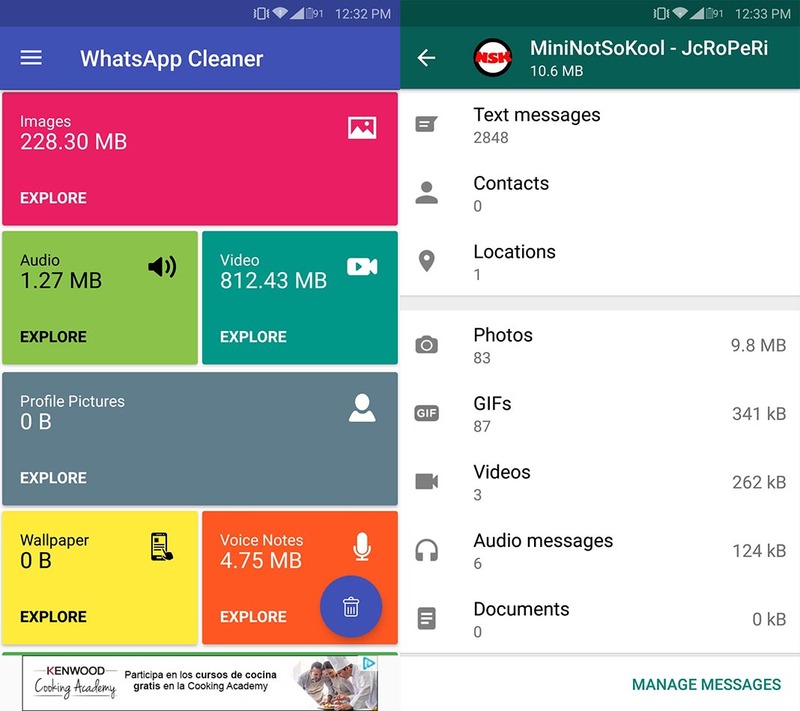 Cleaner for WhatsApp is one of the best apps for the job, showing all the content clearly, however, WhatsApp now includes a special section to easily do the same. To access this section, you just have to go to Settings > Data and storage usage > Storage usage to see the number of files exchanged with each one of your contacts. The problem is that in this case, you can’t select the photos and videos you want, but instead, you have to delete all of them at the same time. That’s why we recommend using the app mentioned above. Lack a variety is no excuse here. Developers have realized that in a lot of countries, technological development in terms of mobile devices is still in its infancy, so they’re practically required to offer lightweight variants of their apps. We’ve already put together a compilation with the 12 most useful lite apps for Android, and we even update it regularly. There, you’ll find must-haves like Facebook Lite, Opera Mini, and Twitter Lite. All these apps use up much less space and memory when running, without sacrificing most of the basic functions. 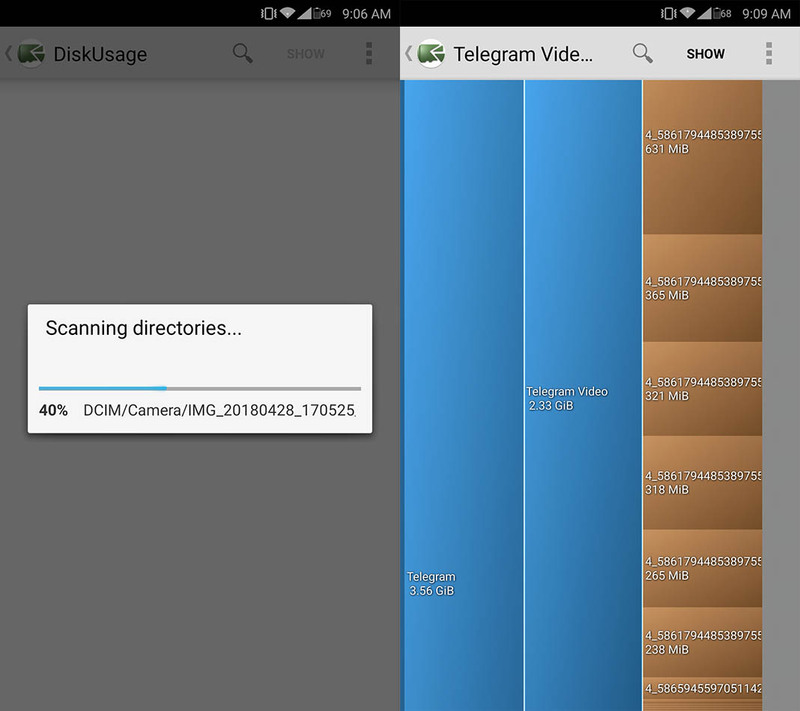 Considering how roomy storage spaces are nowadays, it’s normal that we tend to worry a lot less when downloading files and end up leaving them abandoned in random folders on our smartphone. This means that we often end up storing duplicated content, especially when it comes to multimedia content. A while ago, Google released Files GO, a file explorer that, among other useful functions, includes the detection of repeated files. This is key. Most customization layers outside stock Android include preinstalled apps that, in many cases, can’t be deleted. The best thing to do is go to the app list in the settings menu and check which ones can be deleted manually. The ones that you can’t will continue to be stored in the space reserved for the operating system, but you can make them disappear with a little trick. We explained how to delete them using a series of ADB commands without need to root your device. All you need to do is connect your device to PC via USB and follow a few steps. A lot of users are so dedicated to Google products that it’s impossible for them to work with alternative apps, especially when it comes to browsers. While many people tend to write off Chrome as a resource-hungry app, the truth is that it’s starting to offer more and more tools to prove this impression isn’t quite correct. One of these is the data saver feature that compresses a lot of multimedia files loaded while browsing. And of course, the less data downloaded, the smaller the cache is that’s generated. To activate it, you have to go to Settings > Data Saver. 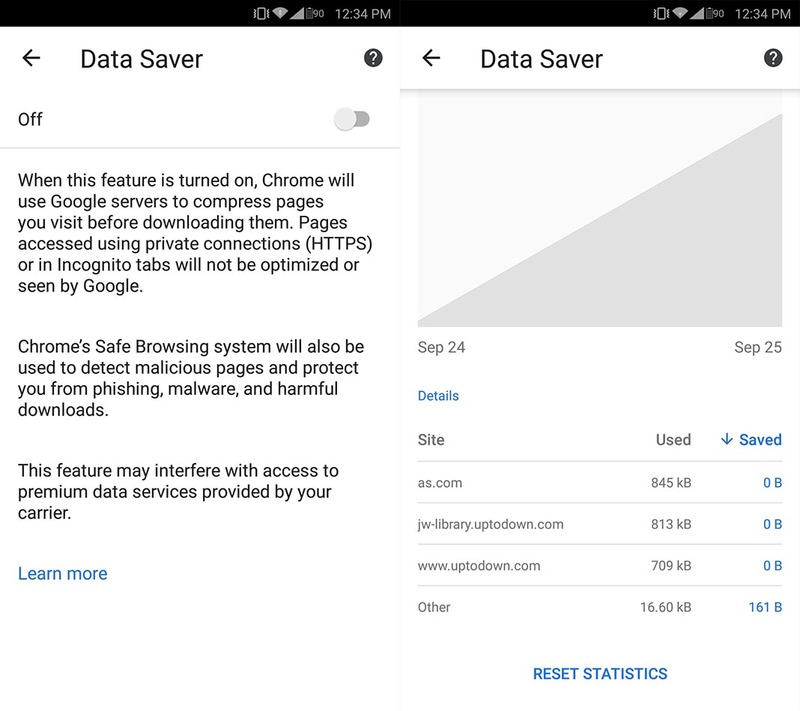 There are a lot of other alternatives like Samsung Max (previously Opera Max), which also pass incoming traffic through a VPN so that the files that reach you are compressed. This is an obvious one that many people overlook. When you download an app through Uptodown, what you save locally is the installer package where the app is found. 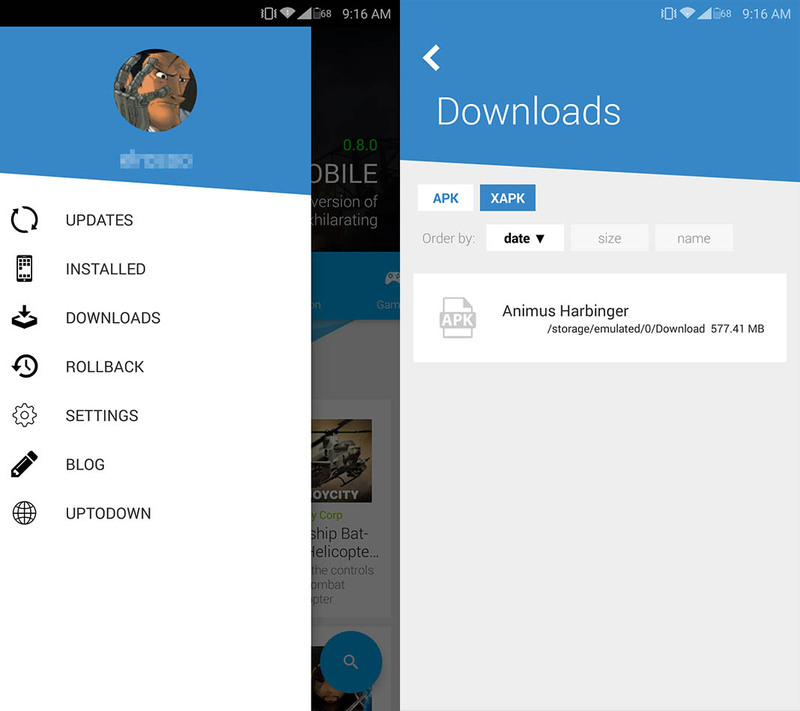 When you install it, said APK file is stored, so you need to delete it manually or make a local copy of it. If you’ve download the file from Uptodown, you can get rid of these files by swiping vertically in the Downloads folder. We can’t openly recommend that you constantly delete the temporary files generated by your apps, since the whole point of them is to help the apps you use frequently to load faster. That’s why if you want to delete the cache or temporary files, it should be for the software you don’t use often. The best way to do this carefully is by going to the list of installed apps in the settings menu and taking a look at the data and cache being used by each app. 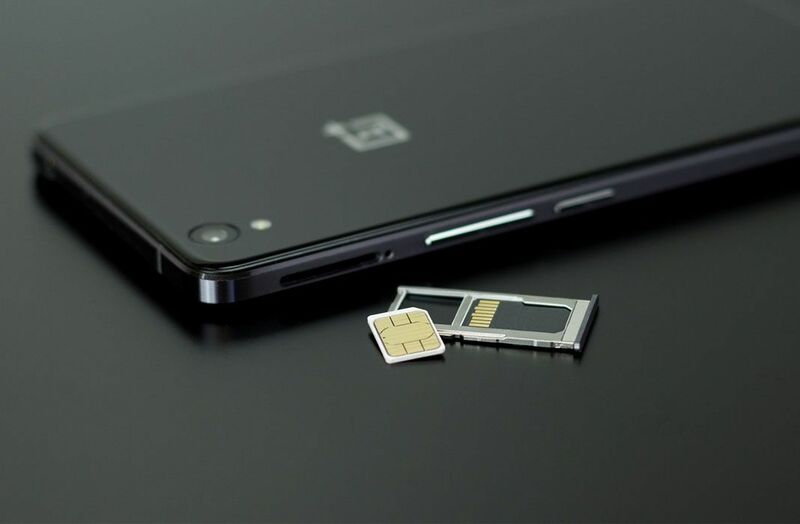 Nowadays, everyone and their mother has unlimited 4G connections on their smartphone, so working past our skepticism when it comes to using virtual storage services, it’s a good idea to work remotely when it comes to saving files. 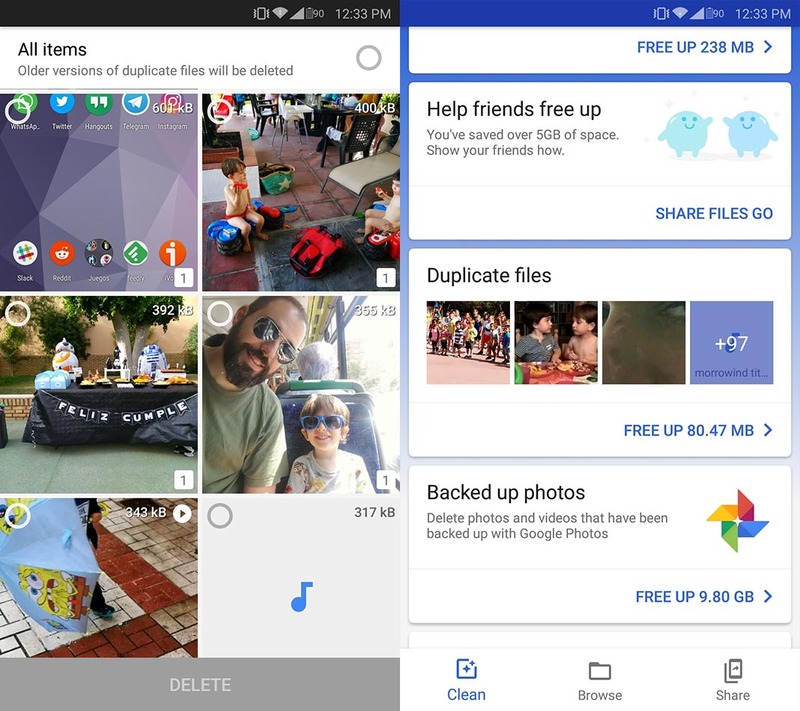 In fact, Google Photos lets you automatically save files in your virtual account without any limits and delete the local files after a certain amount of time has passed since they were created. Even so, the 15GB offered by Google in Drive might fall short, so it’s nice to take a look at these tips for freeing up space in the cloud. And now we’ve really come full circle. Local storage routes are inscrutable, so in certain cases, it may be best to just do an complete factory reset and get rid of all the remnants stored over the span of months (or years) and that leave a trail of temporary files and half-empty folders that add up to a huge waste of local space. In terms of the possible loss of data, there’s no reason to worry, since most apps automatically save your information in the cloud. But if you’re still having doubts, here’s the article where we talk about creating backups.